Godiva LicoWhite™ Whitening Soap cleanses and whitens as it events out skin discolorations. A gentle, non-drying cleanser enriched with Glabridin from licorice for brighter, fairer skin. It has high levels of whitening ingredients for faster results. Safe for continued use for longer-lasting whiter skin. 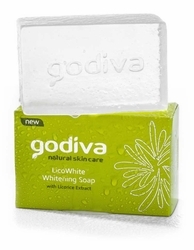 Godiva LicoWhite Whitening Soap comes in a clear soap bar, free from any colorants. This bar boasts of having the ingredient Glabridin (from licorice extract), which suppresses melanin (dark pigment) formation and gives the skin a lighter appearance over time. But because it suppresses melanin, which is our body's defense mechanism from the sun's UV rays, this can make our skin more sensitive and prone to burning. - Preferably use them only at night. - If you choose to use whitening soaps during the day, never skip applying SPF. - It is gentle and non-drying compared to other brands of whitening soaps. - It is easy to rinse. - It leaves the skin squeaky clean but not dry and uncomfortable. up to 3 months if used only once a day (at night). - Licorice is a natural ingredient and this makes the soap safe for continued use.